The man, the myth, the cartoon hero, Cowboy Dave is back, looking to turn any bar into a honky tonk and, of course, save the day. Cowboy Dave is Dave Wilson, the frontman of FortyTwenty. He’s introducing his new group, appropriately called The Cowboy Dave Band. Cowboy Dave is Dave Wilson, the frontman of FortyTwenty. 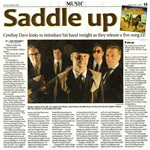 He’s introducing his new group, appropriately called The Cowboy Dave Band tonight at the Zoo Bar. 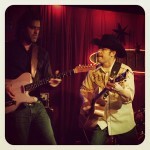 The 9 p.m. show will showcase the new band and serve as a release party for “Saddle Up, Pal,” a six-song EP.